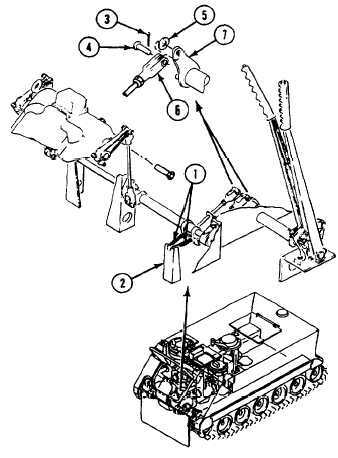 TM 9-2350-261-20-2 ADJUST STEERING LINKAGE INITIAL SETUP Tools: General Mechanics Tool Kit (Item 30, App D) Materials/Parts Cotter pin (2) Screw 3/8-16 x 2-1/2 (2) Personnel Required: Unit Mechanic Helper (H) References: See your -10 Equipment Conditions: Engine stopped/shutdown (see your 10) Carrier blocked (see your -10) Ramp lowered (see your -10) Trim vane lowered and power plant front access door open (see your -10) Driver's power plant access cover removed (page 24-25) Battery ground leads disconnected (page 13-2) A D J U S T NOTE In most cases, adjustment of differential brake linkage is necessary only when a component of the control linkage has been repaired or replaced. 1. Remove air cleaner housing and element (page 7-7). 23-2 Change 4 2. 3. 4. Unlock and release steering levers. Disconnect two return springs (1) from bracket (2). Remove cross-shaft access covers (page 23-10). 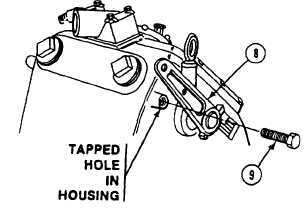 Remove two cotter pins (3), clevis pins (4), and washers (5) from two clevises (6) and steering lever cross-shaft (7). Discard cotter pins. NOTE If holes in differential brake levers will not align with tapped holes in differential housing, loosen adjustment by turning brake adjusting nut to left until holes align. Re-adjust differential brakes (page 21-18). 5. Align holes in differential brake levers (8) with tapped holes in differential housing. Secure with two screws (9).